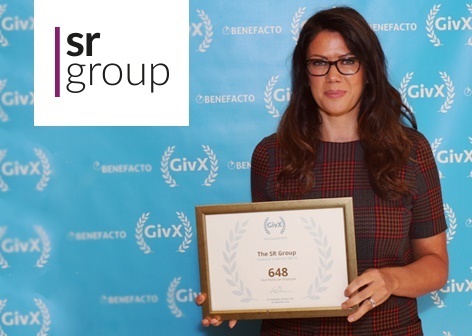 The SR Group has been recognised at the 2018 GivX Summit, held on the 24th of September at the Bank of England. The GivX framework is a simple, standardised way for companies to place a value on their giving and compare their performance with other organisations. A GivX Point is equivalent to £1 and valued in-line with the ‘Community Value’ approach that focuses on the replacement cost of gifts and support for charities. Other companies featured in the Top 25 Award included National Grid, Kellogg’s, Deutsche Bank and ITV, who topped the 2017 Award ranking with a GivX Score of 10,164 per employee. “Last year, the Bank was one of the 28 pioneering organisations to support the launch of the GivX benchmark. This year we were delighted to continue our support by hosting the GivX Summit at the Bank of England and were pleased to welcome the 87 organisations that submitted their data this year. The SR Group are excited to receive this award. Our Social Purpose programme enables us to leverage the incredible networks that we have built over the years and fully utilise the established resources we have available. We developed the agenda to have measurable results that positively impact our society and enhance individual personal development. This has been developed in our London business under the guidance of Jo Major, our Social Purpose Lead. We are also rolling this out to some of our other locations internationally throughout this year.